One of the main reasons that a refinance loan does not close is because of a poor appraisal. We all hear about out-of-area appraisers who don’t know the local market, use of distressed-sale properties to appraise a property that is not being sold under distress, and lack of comparable sales or insufficient data. The key to a good appraisal is using accurate comparable sales and sufficient data to arrive at an appropriate value for the property in question. Here are some tips below that you can use that will improve the odds that the final appraised value is not left up to chance, so your refinance goes smoothly and the value you need is met. After the housing downturn in 2008, Fannie Mae initiated new appraisal rules for loans under the HVCC Act (Home Valuation Code of Conduct), that prohibit loan officers from selecting the appraiser to perform an appraisal on a refinance transaction. What this means is, the appraiser will be randomly selected from a 3rd party appraisal management company, so the appraiser will have no relationship with anyone on the refinance transaction. However, even though the loan officer can’t have direct contact with the appraiser, a homeowner still can. So here are some tips for homeowners that will help move the appraisal process along smoothly, and ensure the appraiser has all the available information needed to complete an appraisal report that is NOT left up to chance. Here are some tips for homeowners that will help move the appraisal process along smoothly, and ensure the appraiser has all the available information needed to complete an appraisal report that is NOT left up to chance. 1. Compile a list of recent improvements.. If possible, include before and after pictures, and copies of paid receipts for the work completed. If major updates were done, provide a detailed copy of the contractor’s bid. 2. Make sure all areas are accessible, including the attic, basement and crawl spaces. This includes the garage. 3. Provide HOA information. If the home is part of a homeowner’s association, include a copy of the fees paid and name and phone number of the association president or association administrator. 4. If the appraisal is for an FHA loan, then the area leading to the attic will have to be cleared and made accessible-the appraiser is required to make at least a head and shoulders inspection of the attic area. 5. IMPORTANT: Carbon Monoxide, Smoke Detectors, Water Straps, Please note, a couple of issues we see on appraisals, is that carbon monoxide and smoke detectors were not installed in the property, appraisers have also been calling out water heaters too. Here is what they advise….”Water heaters must be secured with two straps – one near the top and the other near the base – that are firmly anchored to the studs or masonry. Securing water heaters is mandatory in the State of California”. All of these are CA law and are required to fund a loan. If these are not installed when an appraiser shows up to do the appraisal, the lender will ask the appraiser to go back out to the home again before funding to take a picture to verify they were installed. It can cost up to $175 for a re-inspection, so installing these before the appraiser shows up will save money and unnecessary delays. 6. Straighten up each room. Appraisers are required to photograph each room, and while it may not make a difference to them if the room is messy, there is an underwriter who may be less objective. 7. Finish up any projects. If there are any unfinished projects, make sure the seller completes them before the appraiser’s inspection. 8. If there are any easements, encroachments or any unusual covenants associated with the title, provide a copy to the appraiser. It is the rare appraiser who comes up with a perfect comparable or “Comp” – i.e. a house of the same size and condition, close to the subject property, with similar amenities and that has recently sold. Therefore adjustments must be made, and are actually made in 99.8% of appraisals. Adjustments credit or debit the subject property for the existence or absence of given features. An example of a deck is one thing that distinguishes the subject from a close comp. The comp has one, the subject property does not. The appraiser would determine the value of the deck and subtract it from the comparison property’s sale value – arriving at an approximation of what that comp would have sold for without a deck. Conversely if the subject had a deck and the comp did not, the value of the deck would be added to the sale price of the comp. 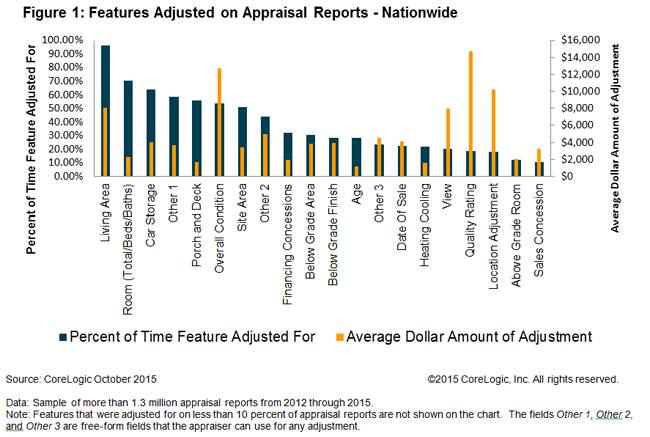 Differences in living area was the most common adjustment, affecting 96.4% of appraisals and with an average impact of about $8,000. Other features that were adjusted on 50% or more of appraisal reports were Room, Car Storage, Porch and Deck, Overall Condition and Site Area. For example, Room adjustments were very common at 70.4% but had minimal value influence, recording an appraisal adjustment of only $2,246 on average. Conversely, a Quality Rating adjustment had the highest value influence, with an average adjustment of $14,748, but accounted for only 18.7 percent of all adjustments. Remember, as appraisers have no relationship with any parties on the transaction anymore, unfortunately there will be appraisers who may not care what the final value is, as they get paid regardless of the quality of their work. Therefore, it is important to do what we can to improve the odds that the final appraised value is not left up to chance, so the value you need is met and your refinance will fund with no issues. If you have any questions about appraisals, or any concerns you would like to bring up before the appraiser comes out to appraise your home, please feel free to contact me directly via email or at 858-442-2686. So this way we can determine the best course of action to ensure you will get the value you need to meet your refinancing goals.